While chaintech is a potential solution to operational problems, firms must conduct suitability studies to confirm the technology fits. Boston, March 28, 2017 – Firms around the globe face the task of sorting through abundant blockchain rhetoric—some of it overdone, some of it underinformed, and much of it wrapped in technical lingo. The temptation to ignore this new trend is strong, but distributed ledger technology (also called blockchain technology or chaintech) is poised to give businesses a lower operational base, greater automation, and faster delivery times. Chaintech-complacent businesses risk becoming the Motorola or Nokia to someone else’s Apple. 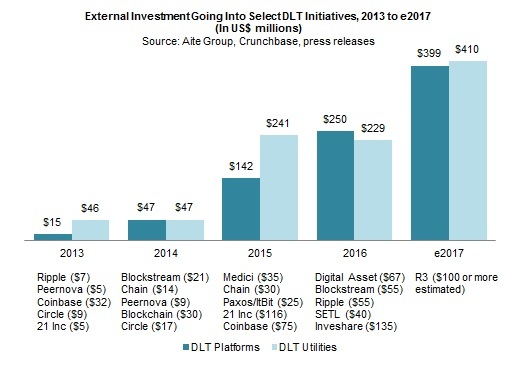 Based on qualitative Aite Group interviews from June 2016 to February 2017 with 30 senior executives, this report illustrates the nature of competition in a world with blockchain and introduces key platforms to watch. The analysis is grounded in a particular DLT use case (securities settlement), but its “how to” treatment is beneficial for a wide range of financial and nonfinancial applications. This report is the fourth in a series on chaintech—see the first, second, and third for more on this topic. This 31-page Impact Report contains five figures and eight tables. Clients of Aite Group’s Wealth Management, Wholesale Banking & Payments, or Retail Banking & Payments service can download this report, the corresponding charts, and the Executive Impact Deck. This report mentions ABN Amro, Accenture, ASX Group, Axoni, Bloomberg, Broadridge, CGI, Chain, China LCME Group, Citibank, Deloitte, Depository Trust & Clearing Corporation, Deutsche Boerse Group, Digital Asset, EY, Enterprise Ethereum Alliance, Ethereum, European Association of CCP Clearing Houses, European Central Securities Depositories Association, FIS, Fiserv, Goldman Sachs, Hitachi, Hundsun Technologies, Hyperledger Project, IBM, ​ICAP, Infosys, JPMorgan Chase, JPX, London Stock Exchange, Monax, Nasdaq, Nomura, Nomura Research Institute, NTT Data, Overstock.com, PwC, Post-Trade Distributed Ledger Group, Rakuten, R3, Ripple, Sapient, SBI Holdings, SETL, SWIFT, Symbiont, Synechron, Tata Consultancy Services, Temenos, Thomson Reuters, Wipro, and World Economic Forum.